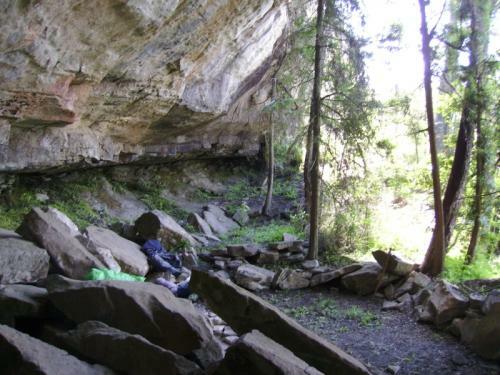 The cave is situated in a band of sandstone in the Monk's Cowl area to the north of Steilberg, overlooking the Cathkin valley and Drakensberg Sun hotel. It can be reached from the Monk's Cowl entry point or from the hotel and chalets below. Both routes involve a vigorous climb up Steilberg - including some scrambles - along a path which is quite eroded in places. You will still need to pay your overnight fee and fill in the rescue register at Monk's Cowl if you want to leave from the hotel. Three Pools Cave is a large, deeply shaded sandstone overhang with a waterfall flowing over the middle of the lip into a forest patch below. In summer the waterfall causes a large area of the cave to be damp and muddy. The cave is named after the three small pools from which the waterfall flows. 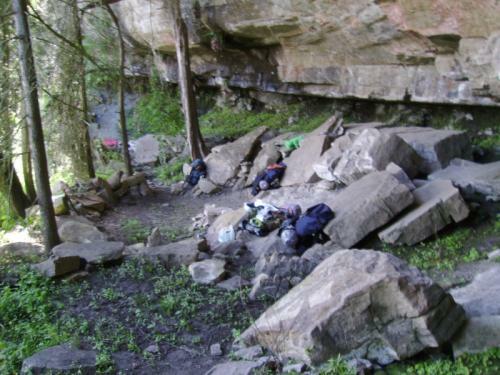 There are several sleeping areas, most of which are almost perfectly level, although they are either muddy or dusty. There are plenty of large rocks to use as furniture. 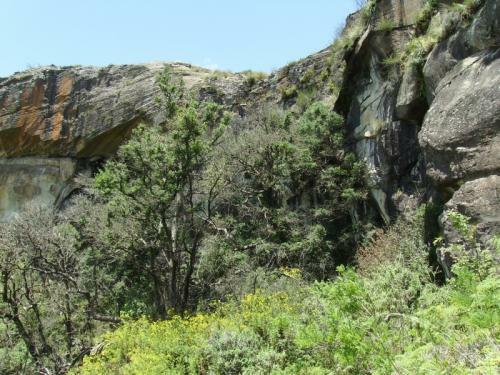 Besides the stream which feeds the waterfall which flows over the cave, there is another stream about 100 metres away which meanders through a large section of bed-rock. Both streams continue on down below the cave, but access to the water in this direction is more difficult. Both streams may dry up completely in winter. There are some small pools in the streams above and below the cave - just large enough to wallow in. The cave is deep and large enough to provide good protection from the rain, and the trees and bush in front help screen the occupants from the wind. However, the waterfall can provide a rain shower of it own! The deep shade makes it a cold cave in winter. The view immediately in front of the cave is obscured by the forest, but a short venture above or to the sides of the cave provides a fine view over the Cathkin valley and civilization. The small, shallow valley immediately above the cave is quite picturesque.